I got hungry the other day while shopping, and that's when I realized how difficult it really is to eat healthy. Most, if not all quick snacks that are at hand are either full of sugar (think milk teas, shakes, even yogurt), fried (french fries, chicken fingers, fried dimsum), full of preservatives (hotdogs) or cleverly disguised (fried fruit or fried savory pies, cereal snacks). I'm no strict health buff, but after coming off the 7-day diet, you begin to differentiate the "edible" and the "not". 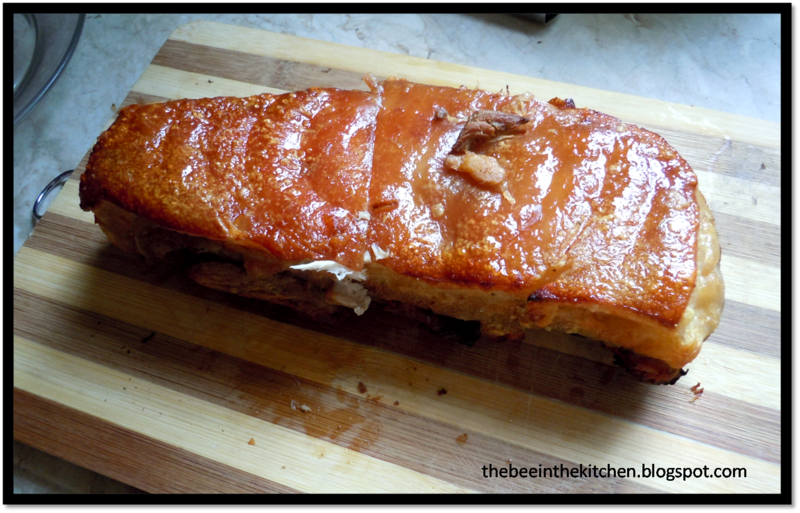 I share with you this succulent not-fried pork belly or what is often dubbed as "lechon kawali", "lechon macau", or "cuchifrito". Just a warning, since this isn't fried, it might be a bit trickier. But do read on for tips on how you can save time and effort. This is one of our help's specialties and has been most requested by relatives. 1. Season the pork belly with salt, pepper and garlic. 2. Boil a pot of water, making sure there is enough to cover the whole cut. 3. Cook pork belly in boiling water, until cooked through. Color will turn from red to really pale. This is ok, and should be right. Though it's difficult to overcook, don't overcook, take it out as soon as ready. This should take anywhere between 45mins-1hour, depending on the number of pork bellies, the size and temperature. tip! *Once you get the hang of it, you can boil several pieces together and freeze them so you have something ready for roasting anytime. We do this all the time. 4. Refrigerate overnight. Try not to add spices aside from garlic. You really do not need to. 5. Roast in turbo broiler until the skin turns golden (as in photo). Broiling time really depends on your broiler too. tip! *Don't broil while meat is fresh from boiling, it will make the meat tough. Best if cold, but not frozen. tip! *Remember that you have already boiled this earlier, thus, the meat is sure to be cooked through. You're just after making the skin crispy and the oils roasted to make the meat more flavorful. 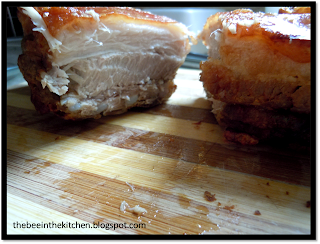 Result is crispy skin and juicy, tender meat! Chop to smaller pieces and serve with mang tomas or ketchup. Leftovers can be used as pork binagoongan, or sauteed chinese style.